Downtown Dental is an advanced state-of-the-art facility dedicated to TMD/J and sleep apnea treatments. Dr. Daron Clark is a recognized expert in the treatment of these disorders. He and his team can work with you to manage the serious disease of sleep apnea. Dr. Clark is also part of a collaborative team consisting of sleep physicians, sleep techs, sleep centers, ENT physicians and pulmonologists who all combine their expertise where needed to maximally manage obstructive sleep apnea and snoring. Obstructive Sleep Apnea (OSA) threatens the health and well-being of millions of Americans. When breathing is obstructed during sleep, the amount of oxygen coming into the body is reduced, creating toxic health conditions. Sleep apnea sufferers labor to breath while sleeping and the body does not rest or sleep properly to refresh itself. This affects a person’s health, daily function, work performance, relationships and overall well-being. Sleep apnea is much more than annoying snoring. It is potentially life-threatening. A sleep study can determine which kind of sleep apnea a person has. In the cases of Obstructive Sleep Apnea, the soft tissues around the throat collapse during sleep to cause an obstructed airway. This includes the tongue falling back out of position to create the airway obstruction. This happens then the jaw is underdeveloped, not leaving enough space for the tongue. Epigenetic science can make room for the tongue by fully developing the jaw bones, thus eliminating the obstruction. Dr. Clark is one of only a few dentists in Nashville state to use a “physiologic” based sleep appliance to create the most comfortable and maximally effective oral appliance designed for sleep breathing problems. He can provide a superior level of sleep appliance care, but even more exciting is the option to eliminate sleep apnea and have no need for an appliance with his unique orthopedic/orthodontic treatment program. The Greek word “apnea” literally means “without breath.” There are three types of apnea: obstructive, central, and mixed; of the three, obstructive is the most common. Despite the difference in the root cause of each type, in all three, people with untreated sleep apnea stop breathing repeatedly during their sleep, sometimes hundreds of times during the night and often for a minute or longer. Sleep apnea is very common, as common as adult diabetes, according to the National Institutes of Health. Risk factors include being male, overweight, and over the age of forty. However, sleep apnea can strike anyone at any age, even children. Yet still because of the lack of awareness by the public and healthcare professionals, the vast majority of suffers remain undiagnosed and therefore untreated, despite the fact that this serious disorder can have significant, and deadly consequences. When a jaw is underdeveloped, a person’s tongue seem too big for the mouth. Unfortunately, when a person reclines to sleep, the tongue easily falls back to obstruct the airway. When the tongue is properly positioned, there is no obstruction and the person can sleep with normal breathing. The new MicrO2 Sleep Device (Prosomnus, Sleep Technologies, Patent Pending) is designed to address many of the known opportunities for optimizing the performance of MADs. 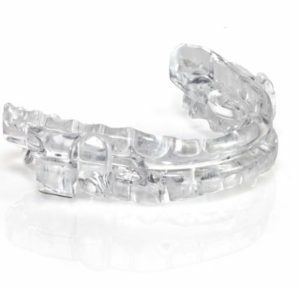 The MicrO2is the first sleep device made from a control cured dental grade poly methyl methacrylate (PMMA) material. This material is less porous, allowing the MicrO2 device to be stronger and more biocompatible than MADs made from traditional, cold cured PMMA material. Because the device’s material is stronger, it can be made smaller and more comfortable than traditional MADs. The enhanced material strength also provides the dentist with more treatment flexibility when it comes to optimizing the vertical bite opening. MicrO2 is also the first precision milled MAD. Precision milling, as opposed to manual fabrication, offers advantages with respect to accurately mirroring the patient’s dentition, delivering the prescription consistently, and making it easier to replace if a device is lost or damaged. The CAD/CAM process enables a new titration method utilizing precise combinations of upper and lower arches, each with different fin offsets, designed to achieve the doctor’s prescription. With enhanced retention made possible by precision milling, ball clasps are optional and the MicrO2 device also features a lingualess design that creates more room for the tongue. Another noteworthy feature is the 90 degree dorsal fin angle. The 90 degree fin angle is designed to hold the jaw forward in the prescribed position even when the mouth opens during sleep.